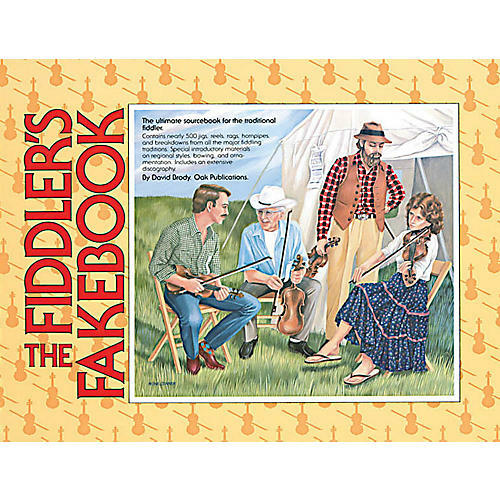 This book has become the industry standard for fiddlers due to its comprehensive amount of instruction and great songs that it packs into one convenient collection. Contains nearly 500 jigs, reels, rags, and hornpipes from all the major fiddling traditions. It also includes extensive information on regional styles, bowing, ornamentation, and even record companies that specialize in folk and fiddle music. It also includes an exhaustive discography as well as a standard song index along with an index of alternate titles that some of the songs may be recognized as. The enormous wealth of material in the Fiddler's Fakebook makes it more than a reference book to be left on the shelf. You will find it helpful in any playing situation - from a square dance to an informal gathering of friends. Songs include: Another Jig Will Do · Apple Blossom · Arkansas Traveler · Bill Cheatham · Bitter Creek · Bonnie Kate · Cotton-Eyed Joe · Cripple Creek · Fiddler's Dream · Fisher's Hornpipe · Flop-Eared Mule · Flowers of Edinburgh · The Girl That Broke My Heart · The Irish Washerwoman · Magpie · Old Joe Clark · Stoney Creek · Woodchopper's Reel · and more.